This is a very corrupt and outrageous case. I was at my friends house on Aug. 3, 1991 and Jeffrey, one of the accusers , came over and apologized directly to me saying he was sorry and his own mother made him lie. I told him that day that I forgave him. He knows that it did not happen. The confession was on audio tape and given to my own lawyer. He said, "We can not use this tape because he did not admit it was being taped"
So, I went back and told my friend Bonnie and Martin that we could not use the tape, because he did not admit that he knew he was being taped. So, the very next weekend, August 10, 1991, Jeffrey came back over and confessed all over again. I had nothing to do with it either time. However, when I gave the second tape to my lawyer, he added something to it. You may be charged with Intimidation of a States Witness and I was indicted for this on August 16, 1991 and arrested on my birthday two weeks later. The Intimidation trial was a big part of my case, because it involved the confession from Jeffrey, which my counsel deliberately hid from the court. The first two times, she did not even show up for court., the third time, she did not show up. Someone went & brought her to court. She changed her story on how I intimidated her. Remember, I never even saw her. She said, I threatened to sue her and changed her story 3 times on the witness stand. The boys mother said, that I said it to her face, then it changed to someone in the neighborhood told her, then she said, her son told her. Still after changing her testimony on the stand, the judge still found me guilty. I immediately gave notice of appeal from District Court to Superior Court and it was signed my counsel, Mr. Redwine. I did not withdraw my appeal. My case came back up on the calendar for November 18, 1991. That retrial date did not happen. 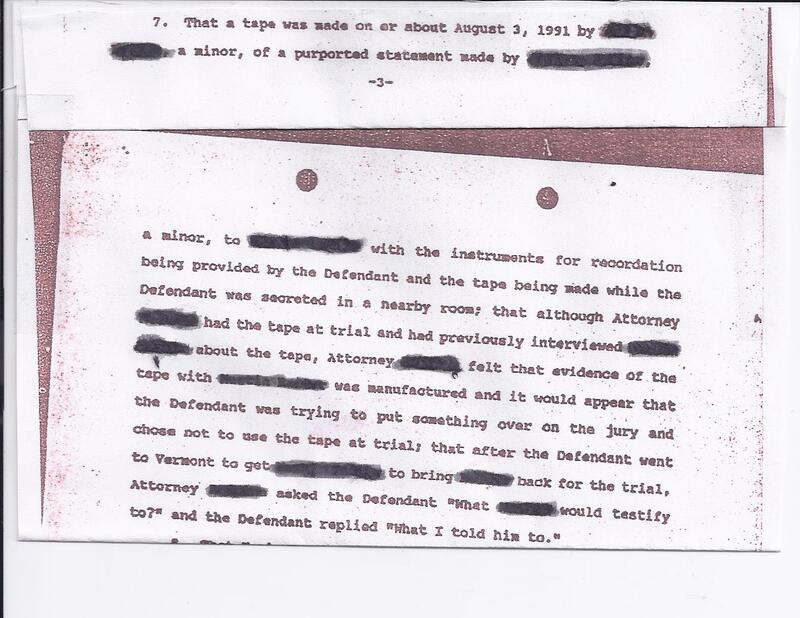 Then I was tried for the Indecent Liberties cases in July 1992, and no mention of the tape or my witness Martin, was allowed to take the stand to tell what happened that day when he made the confession tape and it was hidden successfully with the help of my counsel and the prosecution. Therefore, I was convicted. Sentencing was in December 1992. I was placed on house arrest during my appeal process. Look what happened next! The Intimidation retrial came back on the calendar on June 21, 1993. Guess what the prosecution said. I could not be found. I failed to appear, warrant for my arrest was issued, bond revoked and it was all cleared up without me knowing anything about it. How could I not be found. I was on house arrest and had to call in to the court house every single day for 2 years and NO ONE told me about the date. I would never have found out about this, but I did, since I investigated my own case last year, 2012. This case is very disturbing and I want justice. No one should have to go through what I have encountered. I am an innocent person and want to prove my innocence.